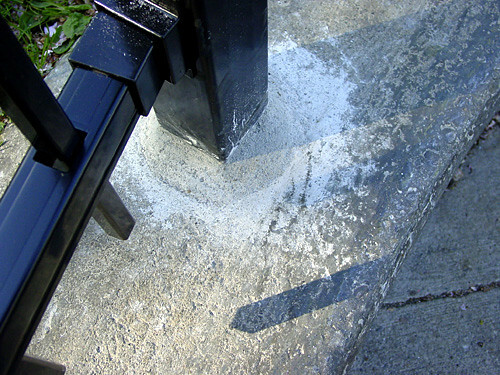 About a month ago I noticed mechanical-looking etches on the surface of a ledge I walk by everyday on my way to work. The ledge surrounds Holladay Park outside the Lloyd Center. It’s not just any ledge, but one that’s quite popular amongst the Portland skateboarding crowd – a little over knee high with a backside curve for the regular footers. I immediately assumed those etchings were the beginning of the end for the ledge’s place in skateboarding. A look at a month-long process. Hurray for fences. Good thing I spend more time cruising unknown hills in the dark than I do shredding ledges these days. Elan, you and Farns aren’t going to turn out to be the same person, are you? get one, use it, make yourself happy. i did, and look where it got me today! so since i can’t comment on your “In the Moving Crowd” posts i’m going to do it here. the new dinosaur jr album is incredibly good. i borrowed it from the internet a month or two ago and its been on steady rotation. seriously, people that have never heard of dino jr are gonna be loving this album and i don’t mean that in the “its hella catchy/poppy” kinda way. its just a solid album that people are gonna love. hears my thoughts on the new white stripes single/album: the single is good. oh, and its called “icky thump” not “itchy thump” but you probly knew that. i’m bad at catching sarcastic humor. anyway, i’m digging the fact that they went heavier/faster with this one. hoping this is reflected on the whole album as i really was not into the last release. looking forward to this album for sure though. There used to be a mini in Marshfield that had chains on transition. Wicked. You’re right – the new Dinosaur Jr. album is a winner and I did know it’s Icky Thump. I’m bad at catching typos that make other words. Commenting on the ‘Crowd is for the weak. wow that matt beach vid is good…and he wears adidas shoes. brilliant. i like adidas. If I had a mini… chains ‘a plenty. If not you have trolls sleeping under the platforms.